I do love it so when we get a truly authentic and genuine wedding submission land in our inbox. 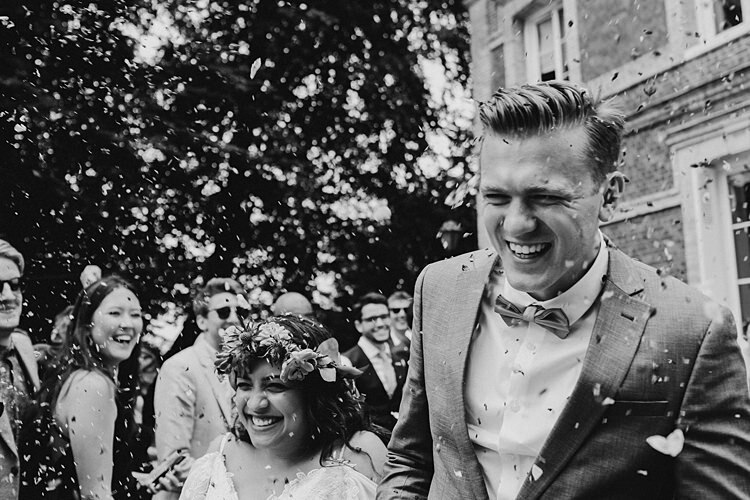 Take this real wedding for example, you can just feel the love radiate throughout the day, the images by Hind Mari are just outstanding (thanks for sharing them Hind!) and we love every single second. 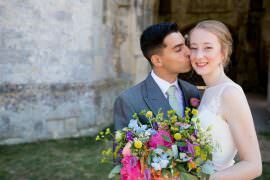 WWW readers Marcelle and Will were wed on the 24th June 2017 at Chateau du Ronchay in Normandy, France. 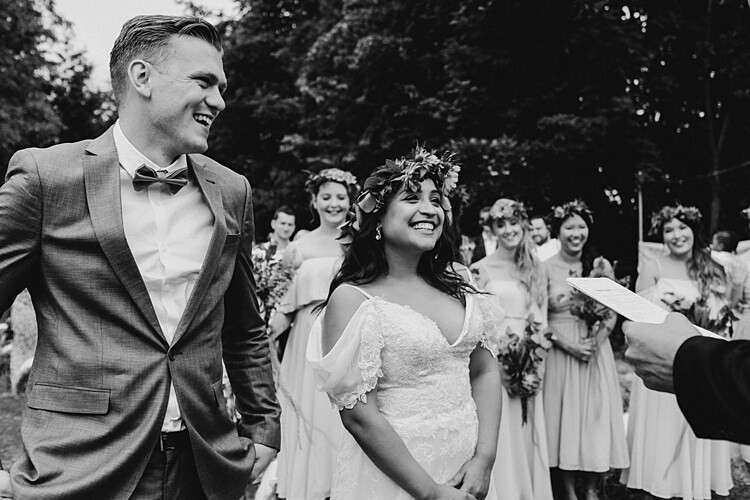 After deciding against an elopement, they were joined by 80 of their nearest and dearest overseas for a weekend of celebrations. The day was a real labour of love, with much of the logistics and décor being DIY. It all turned out perfectly though, with relaxed vibes and super cool style. 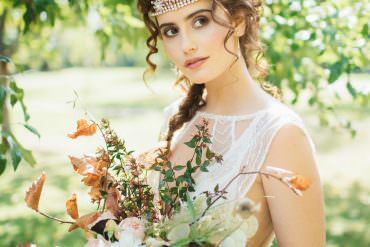 Marcelle chose a boho cool lace gown with off the shoulder straps and a striking floral crown of foliage. 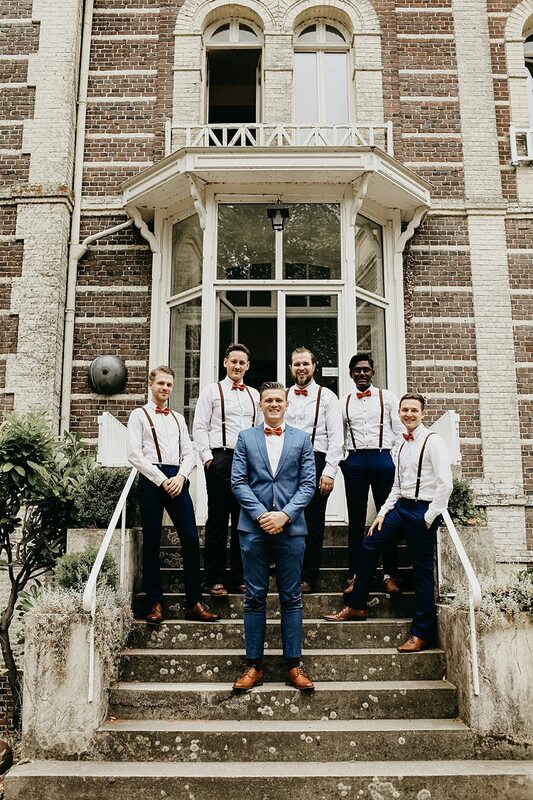 Will went for a vibrant blue suit with his fave gents in braces for a relaxed, rustic look. There are so many ideas here, which you’re totally going to want to steal. From the wooden calligraphy signage, to the use of greenery and copper, not to mention an outdoor meal with festoon lights draped overhead. It’s all so very gorgeous folks. THE PROPOSAL | We got engaged on 15th November 2016 in front of the breath-taking waterfall that is Skógafoss. Will surprised me with a trip to Iceland on my birthday (in July) and got some of our closest friends to come with. He had gone ring shopping with one of my best friends and even asked for my parent’s blessings two weeks before in secret! Will did not show any signs of nervousness and definitely kept his cool during our trip, which meant I wasn’t really expecting it. 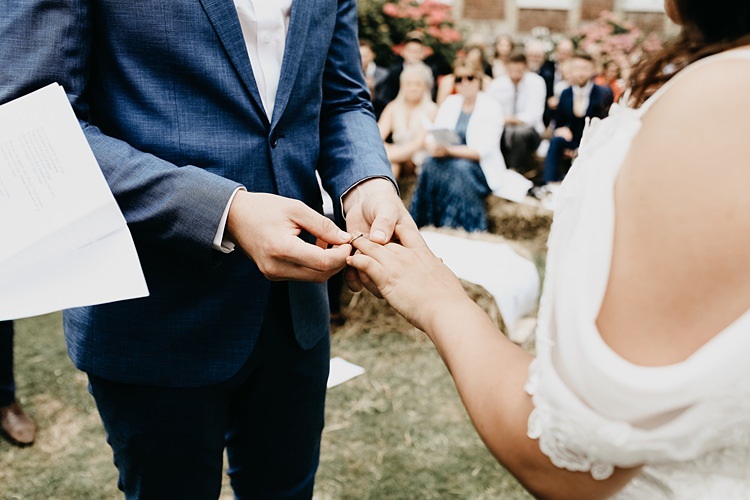 We had spoken about getting married at some point in 2017, but when he knelt in front me and asked me to spend forever with him, I was completely shocked. I also totally told him to “shut up” before actually saying “yes” – oops. 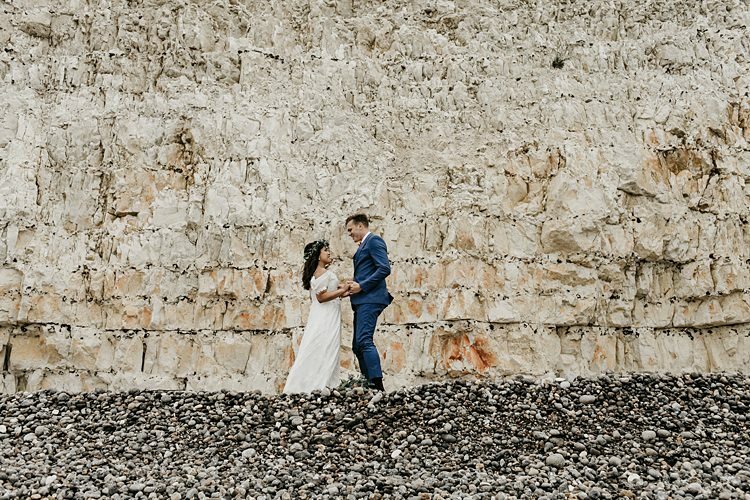 THE VISION | We initially wanted to elope, but after concluding that the drama behind doing so was not worth it (I’m also an only child) we knew we wanted to go abroad and outdoors for our wedding! 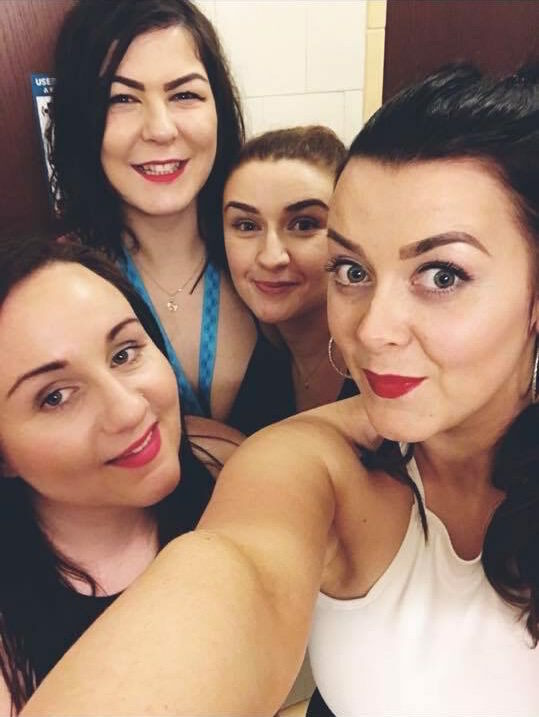 Our vision was to have a day which would be defined by the following: chilled-out, fun, beautiful but most importantly, genuine. We didn’t want it to look snazzy or posh as that’s just not who we are. 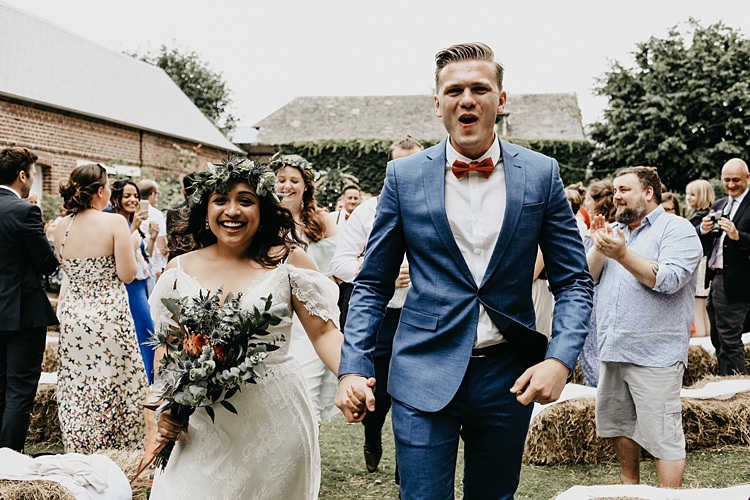 We also knew that it would have to be a lot smaller than a typical wedding and that was one of the hardest decisions we had to make when planning our wedding. 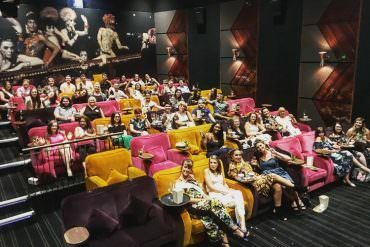 We ended up with 80 people, which is still quite a lot for a wedding abroad but it was far less than the list we knew we’d have if we weren’t strict. 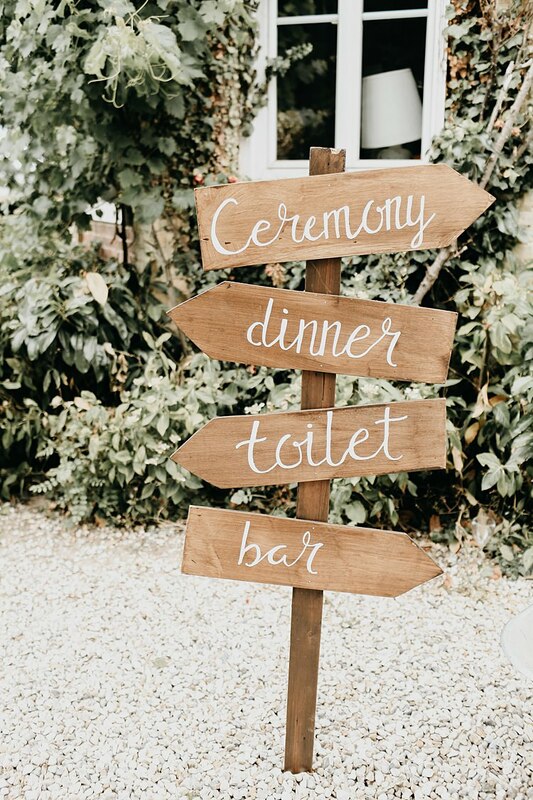 After looking at numerous wedding blogs for ideas (WWW as my main source of inspo!) 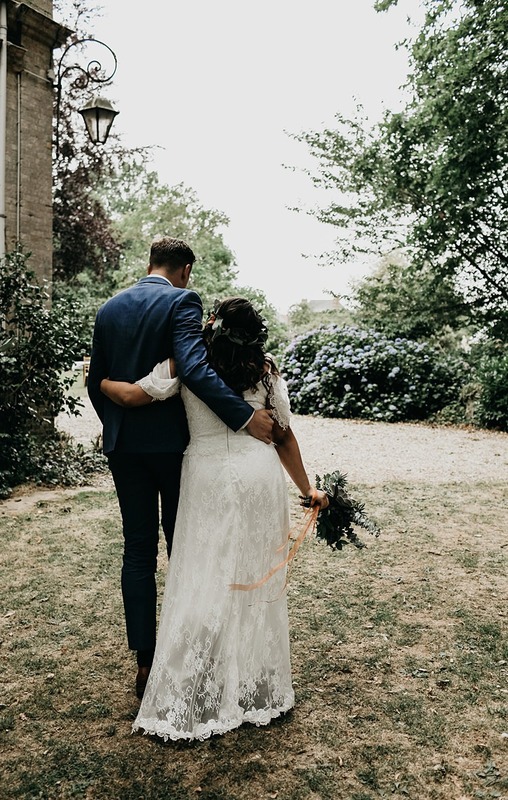 we fell in love with a wedding couple who got married in a chateau in France and just decided to make a week long affair of it all. Not only that, but they had a selected amount of guests and did things their own way, which is exactly what we wanted to do. Northern France was a great option for us as it’s super easy to travel to from England and there are plenty of transportation options. Also, euros! Despite Brexit, it was still a big help for us to have a slightly stronger currency when paying for stuff in France. 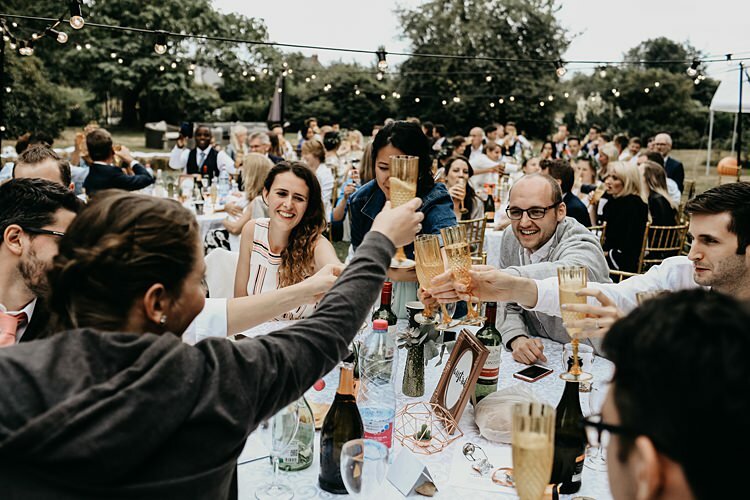 We didn’t do a full week in Normandy but, as most of our guests arrived on Friday, we planned a BBQ on the Friday night before our wedding day just to get the guests to mingle and hang out. Will and I hosted a Mr & Mrs Quiz and my dad and uncle (who are BBQ Masters) catered for the night. 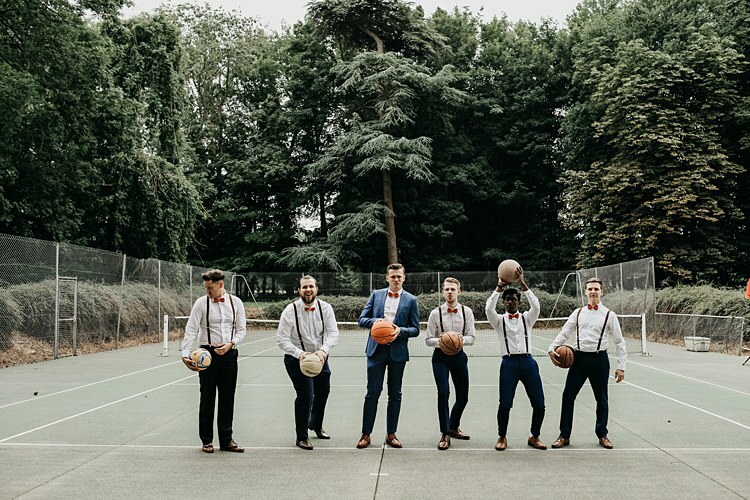 It was such a great way to get our guests to mingle (we arranged them all in different teams) and it was a hilarious way to start the wedding shenanigans. 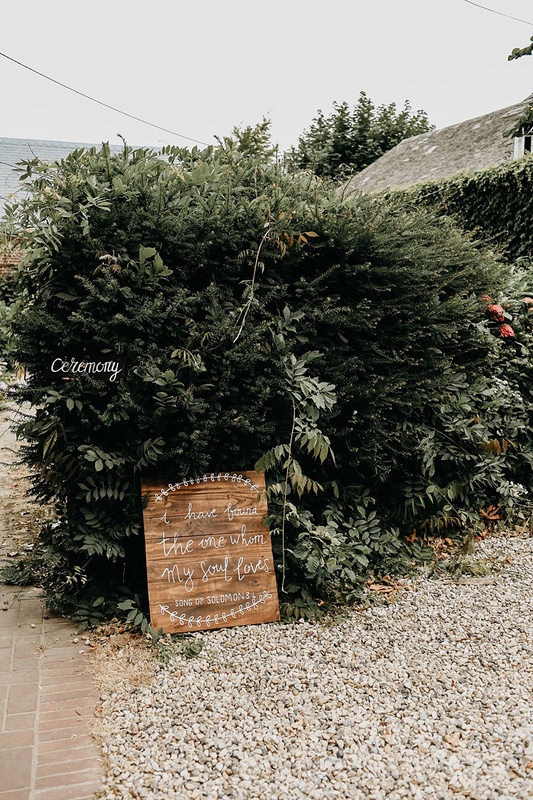 THE PLANNING PROCESS | Despite the craziness of it all, I really enjoyed the planning process (most of the time) – I don’t know if Will feels the same, ha! Being a project manager, you can see why planning comes a little easier for me. But, we’re both creative people too and love to think of new ways to put something together; this was the biggest challenge thus far though. As we’d decided to go abroad, we had to get on the venue hunt very fast in order to confirm the location and tell our guests. Juggling work, family, church life, friendships and planning a wedding is challenging to say the least but, people will have grace for you. I made numerous spreadsheets and lists so that Will and I could keep to our budget and stay on track with everything. It didn’t make for the best date nights but we tried to juggle planning nights and chill nights accordingly so we weren’t always talking about the wedding. This is really important too! 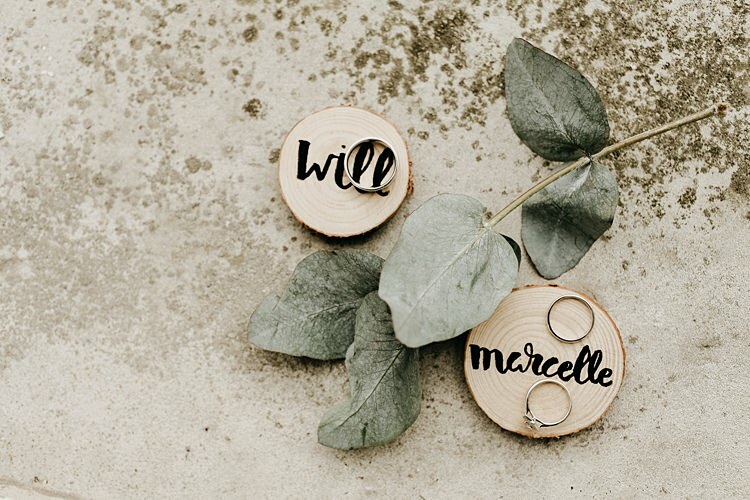 We realised pretty quickly that it was going to be a DIY wedding (much more challenging yet affordable this way) so we had to make sure we factored time in to create all the arts and crafts bits as well. The hard part about this is that we were still deciding what worked best in the different parts of the venue grounds (i.e. where the welcome drinks would be held, the games area etc.) so one my best friends (and bridesmaid) wrote loads of the signs the day before. 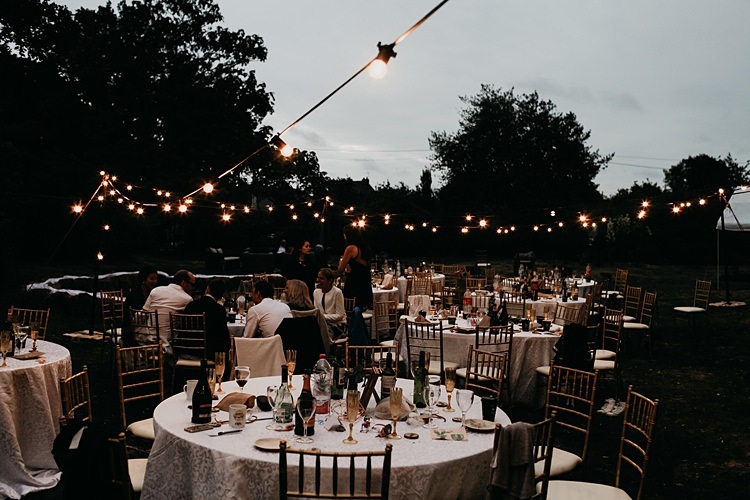 Our venue was a blank canvas, so we also had to think about hiring equipment like festoon lighting for the evening (which was easier to get in the UK) and sort out the logistics of that and a lot more. The more technical/electronical side of the wedding was in Will’s hands as he’s great with that area. 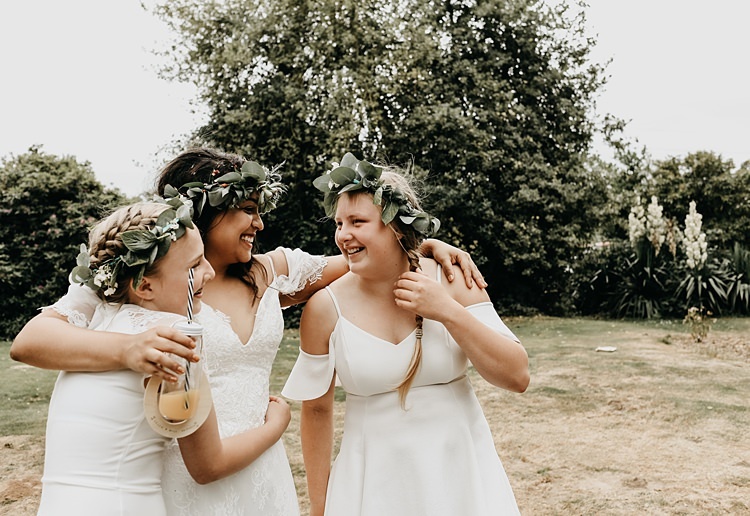 Something we weren’t keen on was to be waited on / served (Will felt it was very unlike us, which is true) so we had to consider the logistics of the day and when the bridal party would bring out what and when. 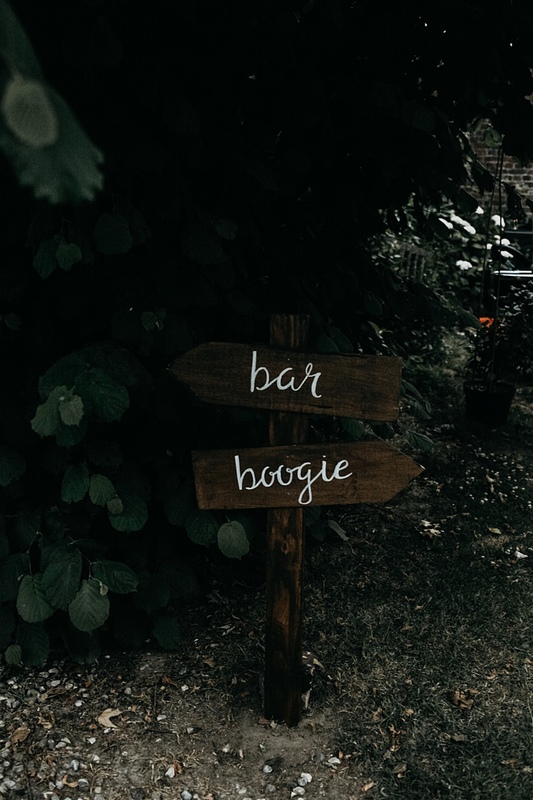 It was a very buffet style wedding, which kept the vibe relaxed. 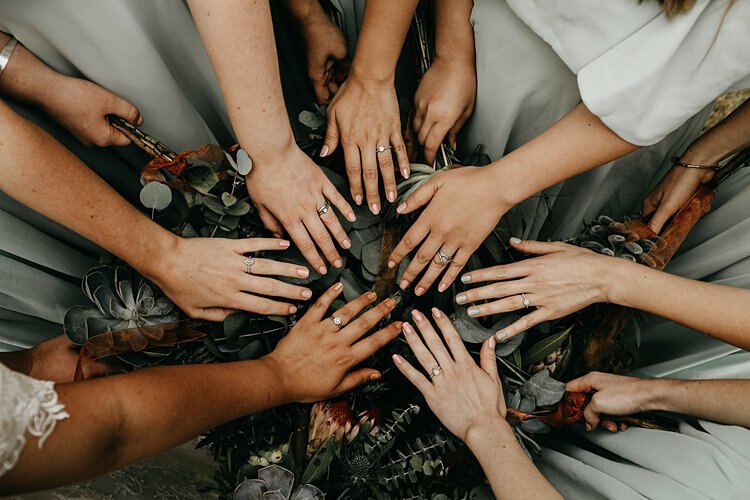 It’s hard not to look back and think we worked our bridal party real hard given the fact that the weddings of some of our friends (in the bridal party) were super easy and we barely did anything. But we are so immensely thankful for their generosity when it came to their time and efforts in helping us put out the different meals and help guests enjoy their time. It made it so personal for us. We also wanted to cater to those who were arriving early to help us. On our first trip to the venue, we stayed at Chalet du Bel Event, a vintage French chateau that was actually a BnB. The hosts were two lovely American brothers who relocated years ago from NYC for a quieter life in Normandy. 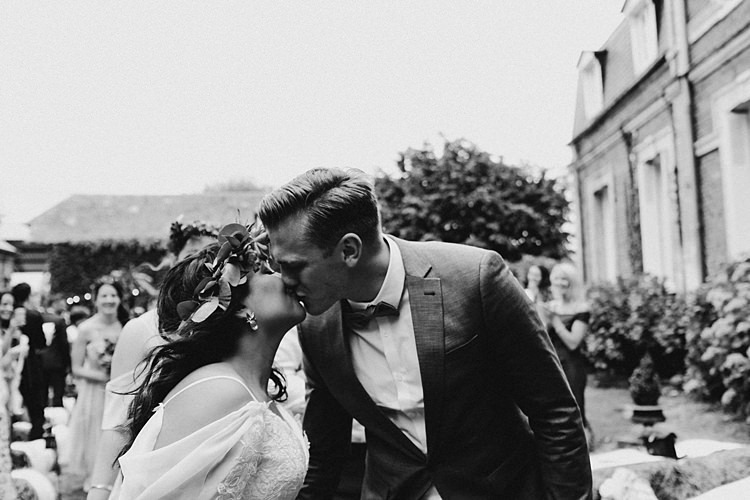 Their chateau was about 10 minutes from our venue and when they found out we were getting married, they offered to give us a discount if we booked out the whole chateau for our wedding guests. 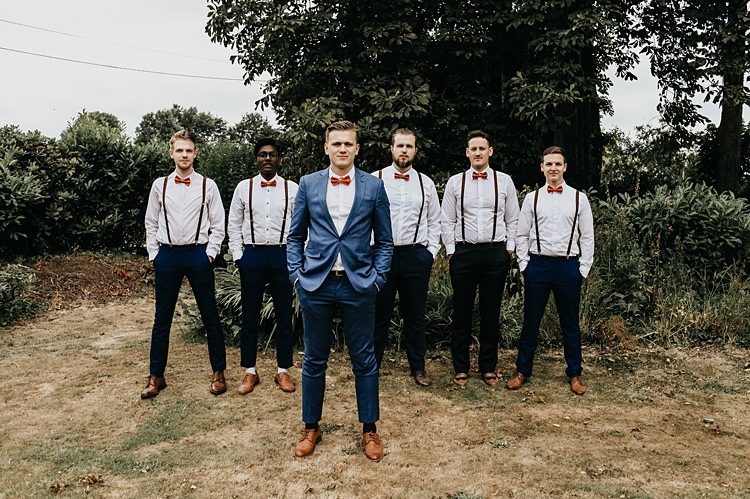 It was a fantastic deal as Will and his groomsmen (plus extra friends!) stayed there on the lead up and they got some great photos of them the morning of (It definitely became a lad-pad though). We asked our friends to contribute a small amount so that we could pay off half, which worked really well and made it more affordable for both parties. 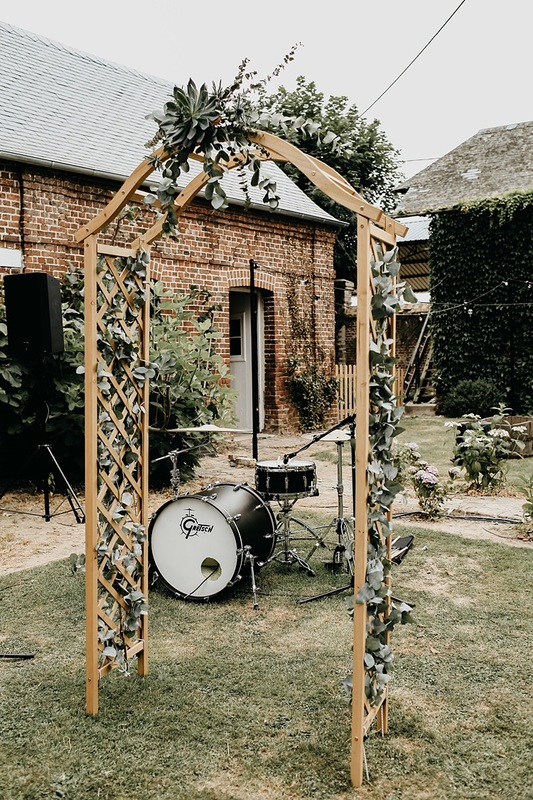 THE VENUE | We got married at Chateau du Ronchay, Luneray, Normandy, France. 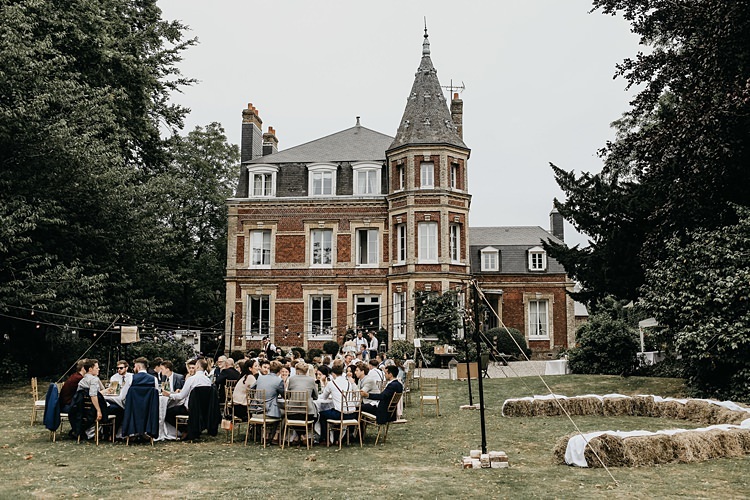 One night, after searching for numerous venues and trying to find one that catered for our number of guests, I stumbled across Chateau du Ronchay on Airbnb (random, I know) And kind of freaked out a little! Will had gone to make us some coffee to keep us sane and when he came back I showed it to him; he loved it. 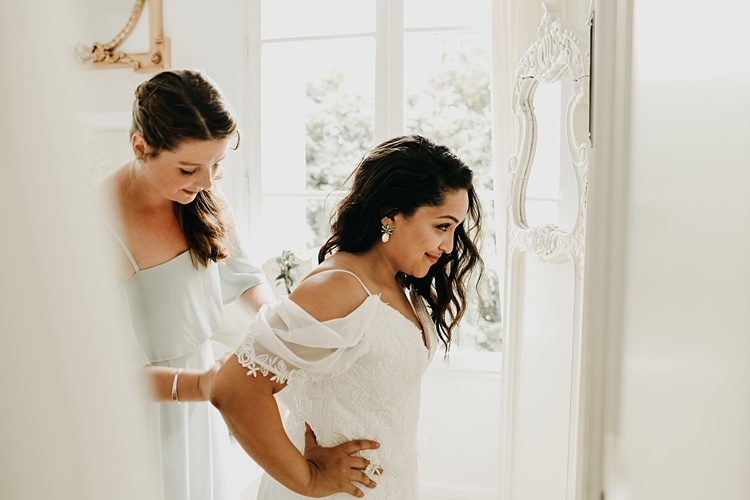 What really appealed to us was that Myriam, the owner and host of the chateau, seemed super friendly and easy-going, something we definitely needed when hosting a DIY wedding somewhere as fancy as France! We got chatting with her and eventually made a plan to visit the venue twice before the actual day. We also planned to arrive on the Thursday of the wedding week to help set everything up. Myriam was super flexible with us and allowed us to come by and check the place out, answering all the questions we had. 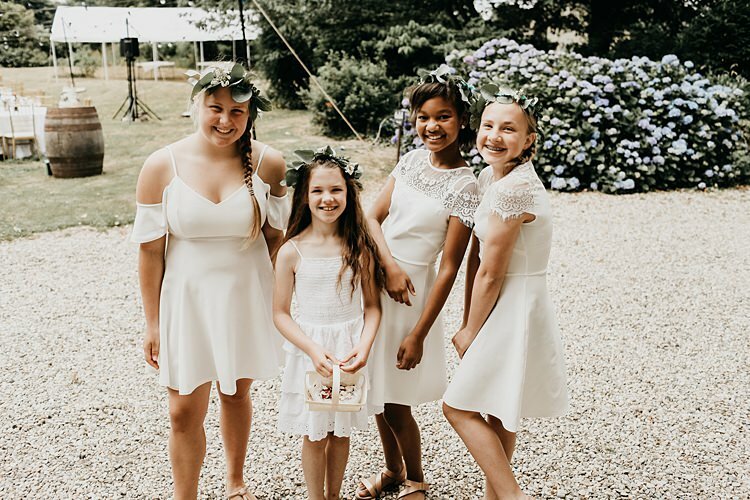 As the chateau is also a popular place for those looking to host big birthday parties etc., she was actually quite busy but she still went above and beyond for us, helping us find the best deals when it came to the food, marquee hire (for our dance floor), tables etc. This was all months and months before the actual wedding day. We are so thankful for her. She became our unofficial wedding planner and honestly saved us when we couldn’t ask for anything in French. We loved that the chateau could also sleep 19 people. Myriam’s main rule was that we treated her home with respect (which is more than valid given its beauty!) and she let us even squeeze a few extra siblings, which was so perfect for us! 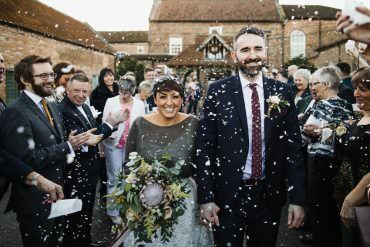 It meant we paid for not just a venue but accommodation for both our parents, my bridesmaids, our photographer and other close friends of others. I know it looks fancy but it’s just full of personality and character. The garden is so lush and we felt it was a big enough hang out space for the wedding reception but not too big where you’d feel far-away from everyone. It was also a bargain. 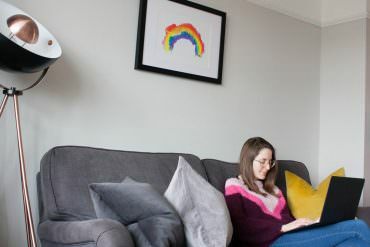 BUDGET | Our original budget was £11,500 (and that’s pushing it) with a bit help of my parents. Neither of us come from wealthy families (or are super rich) and we were adamant not to get into debt just to buy things we can’t afford and impress people for a day. It’s by the grace of God we paid for our wedding and the generosity of my parents who helped us with the big bits like the French BBQ we had and all the beverages. 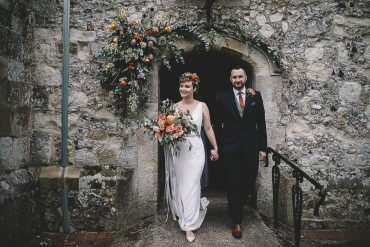 As the week of the wedding came, we were too busy sorting out DIY bits and logistics of the day to keep track of everything else we paid for but I think we stuck to that figure and if we went over, it was only by a little. 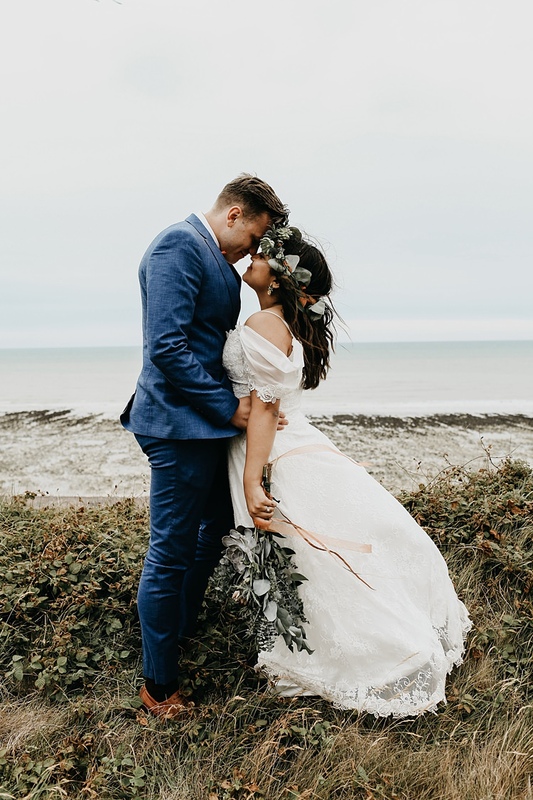 THE DRESS & ACCESSORIES | My dress was from an Etsy shop and was altered by the wonderful Elaine Kennedy from Tantrums & Tiaras in Putney. She was honestly amazing and helped me bring my vision for the dress to life. 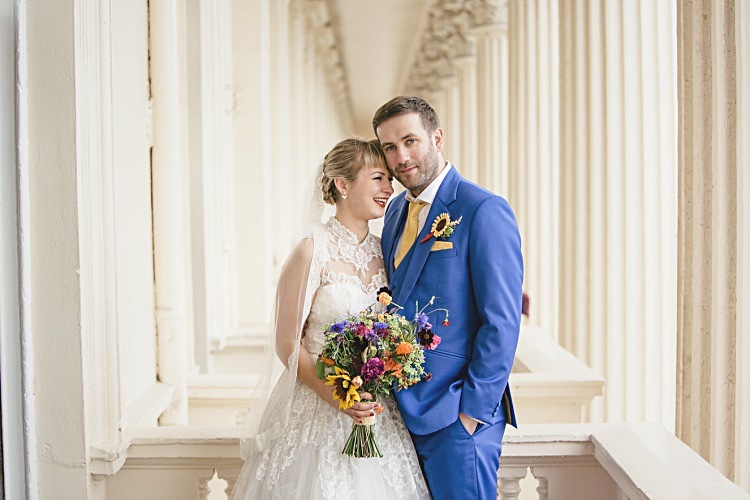 She was also affordable and an absolutely lovely woman – I can’t recommend her enough. 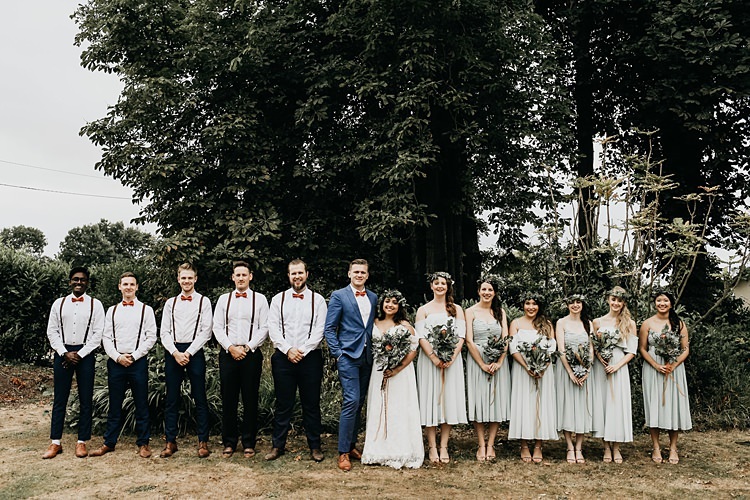 I can also tell you right now that most of my wedding looks like it was sponsored by ASOS! My earrings were from there and yes, they are pineapples. I love pineapples and it’s Will and I’s symbol as it was the first word he learnt in Portuguese (I’m Brazilian!). It represents us and our craziness so I had to have some sort of pineapples on the day! 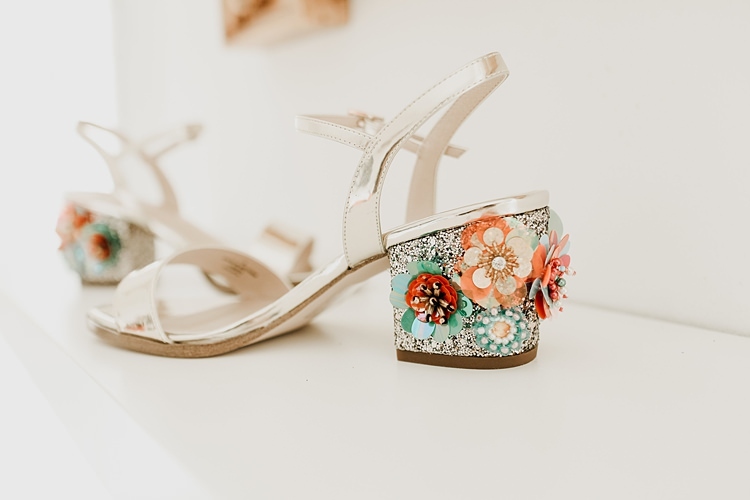 My shoes were also from ASOS and very sequined. I fell in love with them when I saw how colourful they were and they also matched with my girls but just had a bit more bling. Also, it’s a Brazilian tradition to wear gold shoes so it really was a perfect fit. 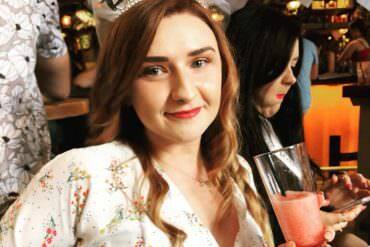 One of my wonderful bridesmaids helped do my gel nails, which were a sparkly copper/orange colour – I loved them. Two of them also did my hair and makeup like actual pros. I have very talented friends to say the least. I didn’t want to look like someone completely different with makeup on and I also knew that I wanted my hair flowing wild and free on the day. 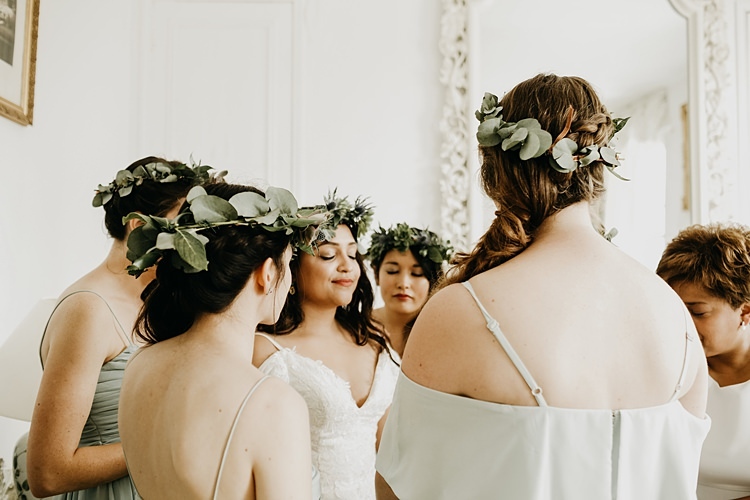 My flower crown (and the rest of them) were made by bridesmaids and a few close friends who arrived earlier during the week. It felt SO special to know that they’d been made with love by those closest to me! FINDING THE DRESS | I actually did not look forward to this part. 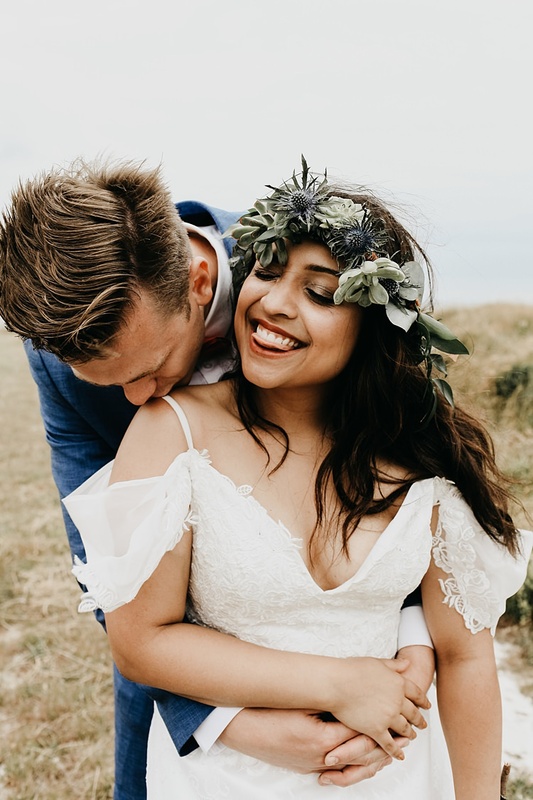 I know most brides love going shopping for their dress but I just couldn’t be bothered with visiting boutiques and falling in love with dresses that were extortionate prices. 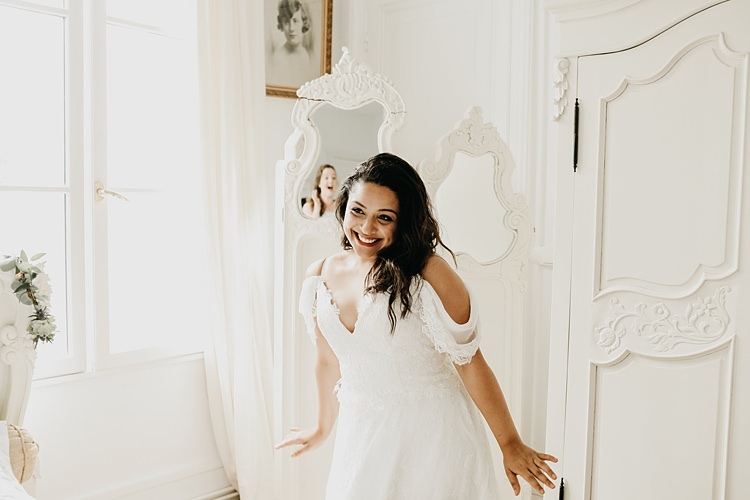 My girlfriends (and mum) had such grace for me because my way of choosing my bridal dress was hilarious. I actually found a picture of it on Pinterest and clicked on the link (thinking it would take me to a dead end) but it turned out to be a real Etsy shop! I loved the lacy look and the fact that it still seemed flowy whilst not being too poofy. It was ridiculously cheap (£185!) but had to be shipped to the UK. 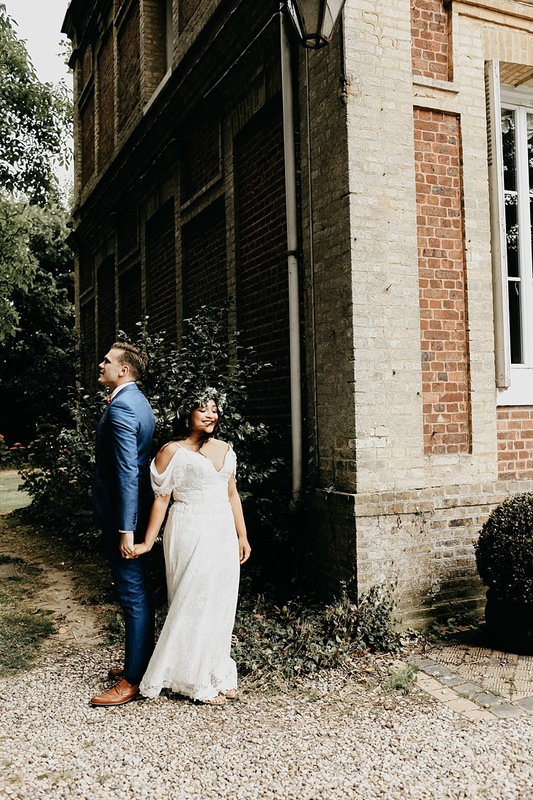 It was a very bold decision given the fact that I just had to send measurements and couldn’t try it on, but I knew I’d just get it altered if need be – and that’s exactly what I did. I found Elaine via a friend and decided to take mum to all the alteration bits. It was important for me to make sure she felt like we’d done it together as I know she was quite bummed I didn’t do the dress-shopping bit. I wanted a dress I could breathe in and one that I could go to the toilet alone with, ha! 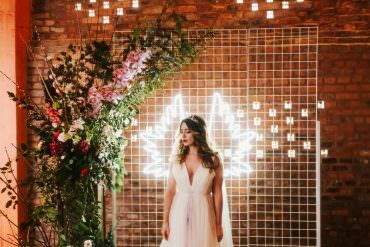 I loved helping my best friend go to the bathroom on her wedding day (when I was a bridesmaid) but her wedding was in a proper venue and the whole vibe was different. I wanted to feel really comfortable and more importantly, like myself. I was so worried I’d look like some crazy version of me so I wanted a dress that was beautiful but suited my personality. 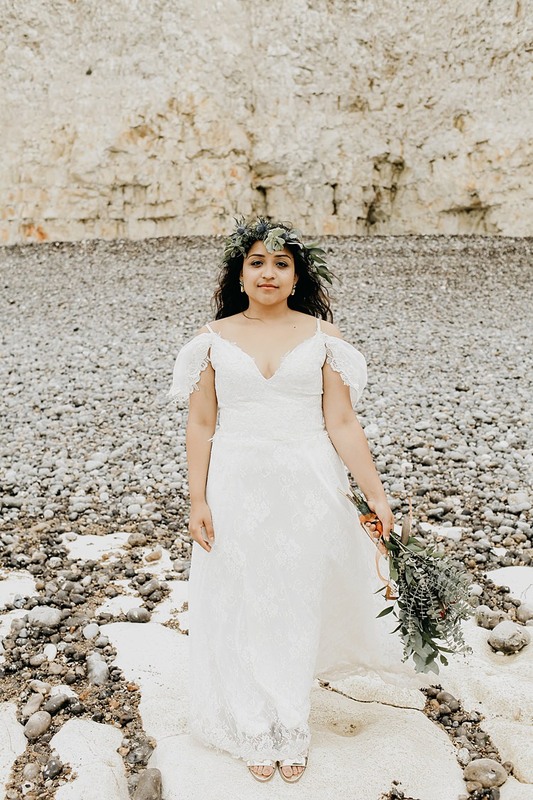 I had ordered an ASOS bridal dress as well and after I got my Etsy dress and had thought of merging the two at one point. 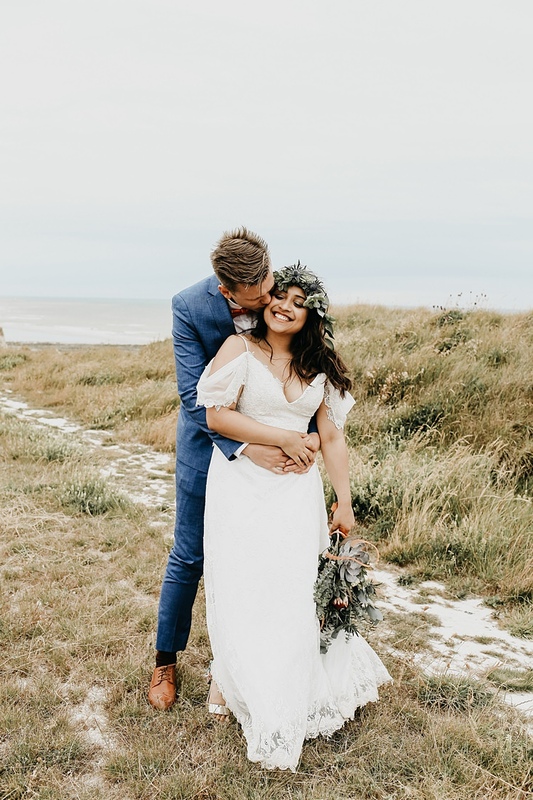 Elaine told me that we could make the Etsy dress work and then use the ASOS one for the evening, which is actually what I did in the end and it worked perfectly. She took off a lot of fabric from the original material and that was actually used to decorate our wedding arch on the day. She also tightened the waist area slightly and added an off-the-shoulder look, which I was really excited about and it looked beautiful. 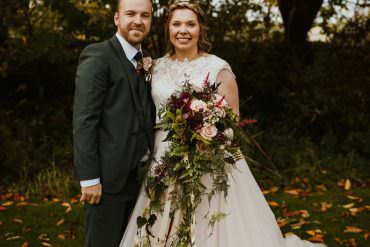 I felt like I got to design my own dress, which was so amazing and it felt truly made just for me. GROOM’S ATTIRE | Take a hard guess? ASOS! I love Will in blue and we found a gorgeous light blue suit for him online, which we bought during a sale. Finding the groomsmen their trousers proved to be slightly difficult (they were either out of stock or too expensive) but we actually opted for different nuances of navy blue in the end, based on whatever they already owned/we could find. 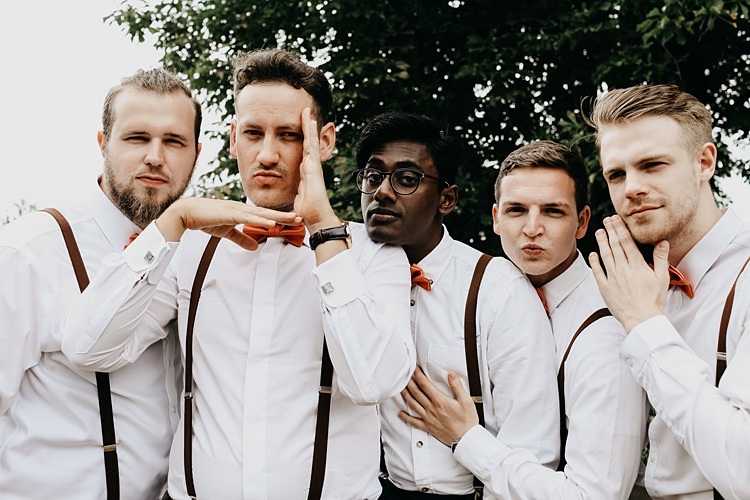 They used their own white shirts and brown shoes and we provided the braces and the copper bow ties; it’s safe to say they all looked very handsome. 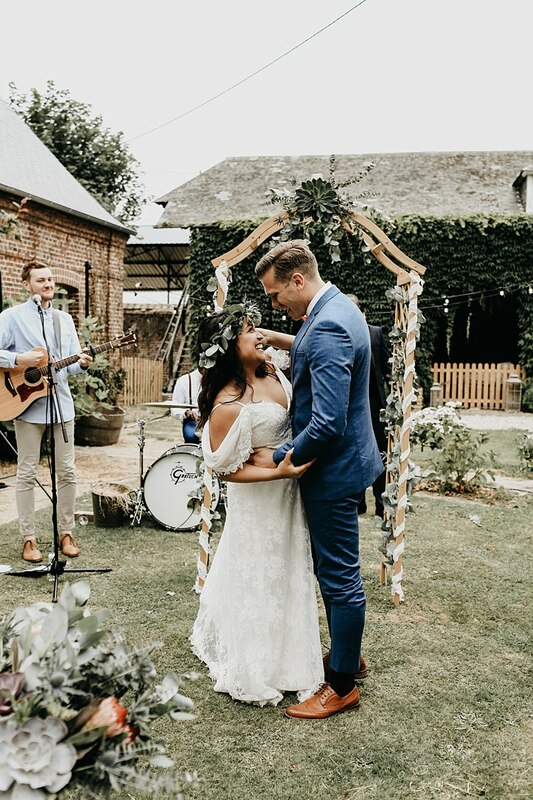 THE READINGS & MUSIC | Will and I met when our mutual friends asked us to sing at their wedding. 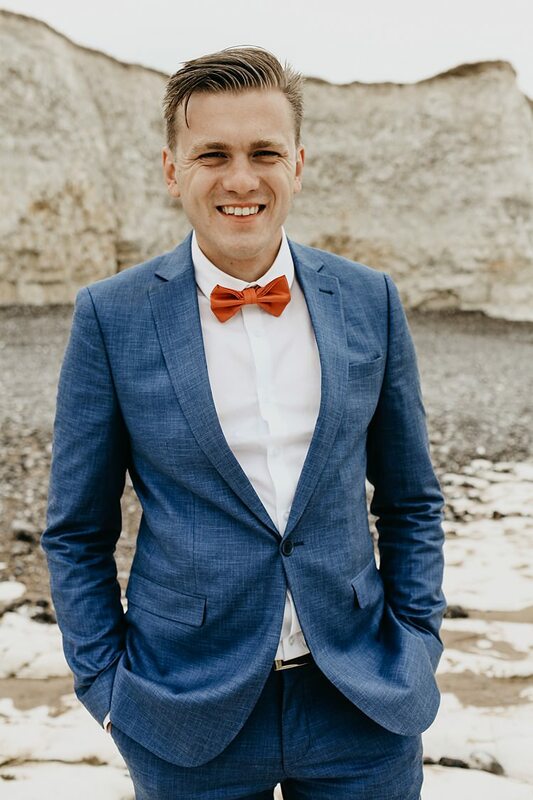 We’d never met before until the first rehearsal and Will pretty much charmed his way into my heart right down to our wedding day (He still does, by the way). So as you can imagine, music is a big part of our lives. We are both part of the worship team in our church and we also love to write songs so this was one of the bits I was most looking forward to. 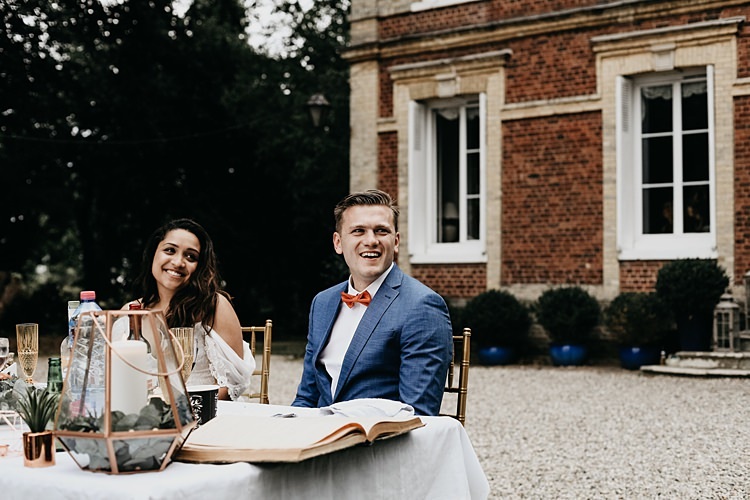 We got legally married at a registry office a few days before (with our parents as witnesses) so our wedding was really an opportunity to celebrate our commitment to each other and to God in front of friends and family. Our faith is so important to us and we are grateful for friends (even those who don’t share the same faith) who celebrated with us. Our church pastors trekked all the way to France to marry us, which was such a blessing for us too! 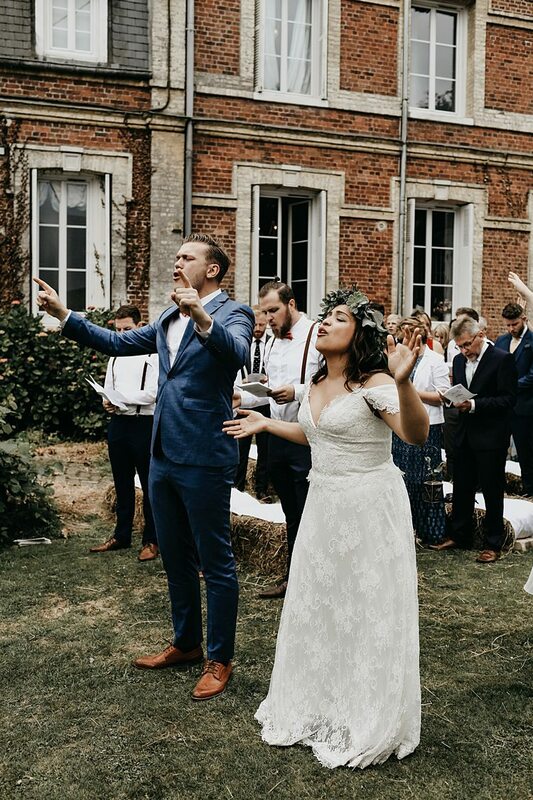 We had a worship band during our ceremony who are a bunch of our close friends, making it an even more emotional day for us. The processional was “Prince of Peace” (Dirt & Grace version) by Hillsong United. It was a wonderful declaration of a supernatural peace being upon our lives and on our marriage as I walked towards my husband. Absolutely surreal. We sang different modern-day hymns throughout the service and had our friends sing a song called “Reign/Rain” as a creative item. The words were spoken over us a prayer and it was stunning. There is a line which goes “the mountains melt like wax before You” which is based on Psalm 97:5. It was such a word of encouragement for Will and I and a powerful reminder that with God, our problems, no matter how mountainous, can be beaten. We walked out to “Relentless” also by Hillsong United. It’s such a joyful song and confirmation that God’s love for us is relentless, no matter how far we drift from Him. All in all, such a wonderful ceremony. 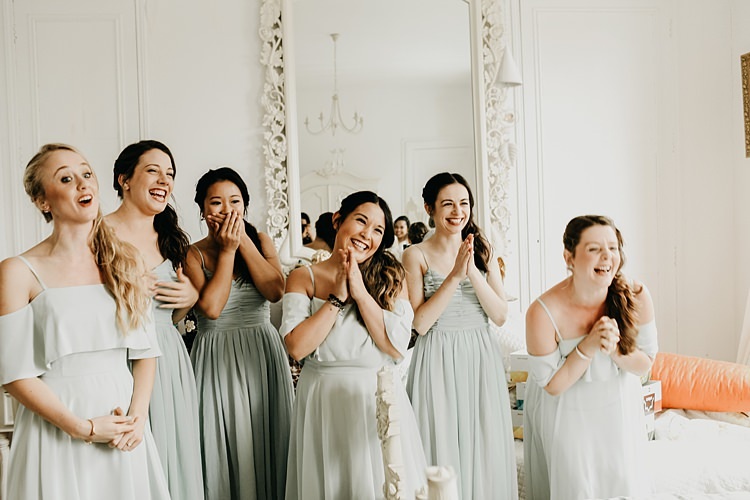 BEAUTIFUL BRIDESMAIDS | My bridesmaids wore mint green ASOS dresses and rose gold block sandals also from ASOS. I was not fussed about nails (as long as they weren’t neon) as the different colours to me, represented their different personalities. 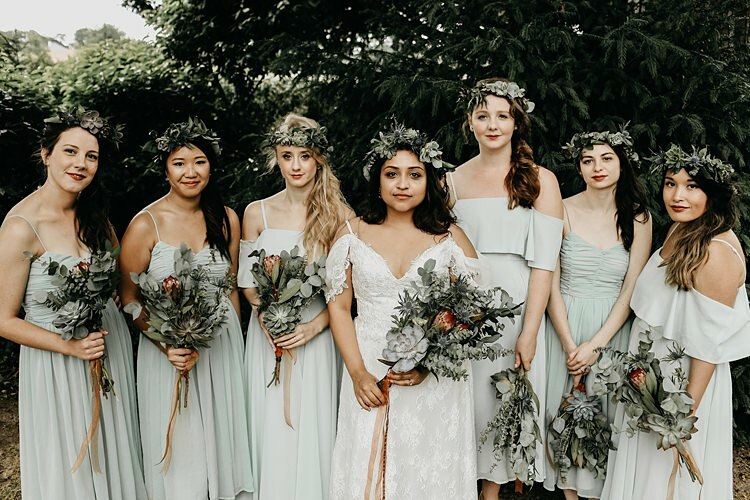 As I had 6 bridesmaids (not counting my ‘junior bridesmaids!) I chose 2 different styles for them to wear. I wanted something they could potentially reuse as summer dresses. My junior girlies wore dresses from H&M and Lipsy, same with the shoes and they were the cutest. I think they all looked absolutely wonderful. The bridesmaids did each other’s hairstyles, which was a similar down and wavy look that I had for myself. It was pretty busy the morning of as I hadn’t done an official itinerary for the girls but we got there in the end! 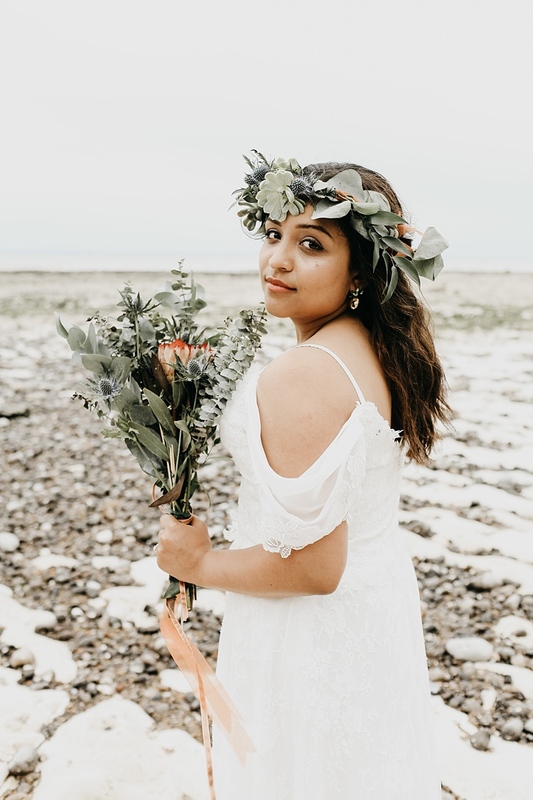 THE FLOWERS | I tasked myself and the bridesmaids the biggest job ever, which was to make our own flower crowns and bouquets. I had a bridesmaid brunch in April, which was not only a fun hangout, we ended up having a super productive DIY afternoon! 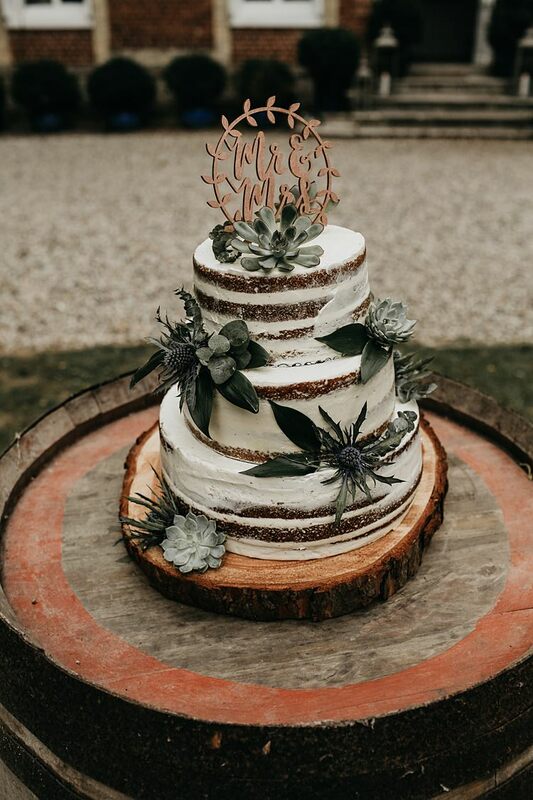 We tried making the crowns and bouquets too and actually nailed it on the first tries, which is crazy given the fact that they were working with succulents! The plants and foliage were from Triangle Nursery who were fantastic suppliers. I bought loads of gorgeous succulents and eucalyptus from them and they were really helpful in advising me on when to order them and how long they’d last etc. My main theme for the flowers were simple but wild. I wanted to avoid roses as I find them super traditional and I loved that dry plants would last longer and endure the transporting from UK to France. The girls and our friends did an extraordinary job with them and I’m honestly still in awe at how good it all looked. THE CAKE | Our lovely friend and extraordinary baker, Martha, made our gorgeous wedding cake for us. Each tier had a different flavour: lemon and lime, raspberry and lime and passionfruit and vanilla. Will and I wanted to make sure that the cake was enjoyed and not wasted (which sadly, happens quite often) so we made sure to serve it right after the meal. It tasted out of this world and went very quickly, there was absolutely nothing left! Oh and did I mention that she drove the cake OVER from the UK to France, and it didn’t fall apart?! She is literally phenomenal. YOUR PHOTOGRAPHER | Our photographer was the lovely Hind. 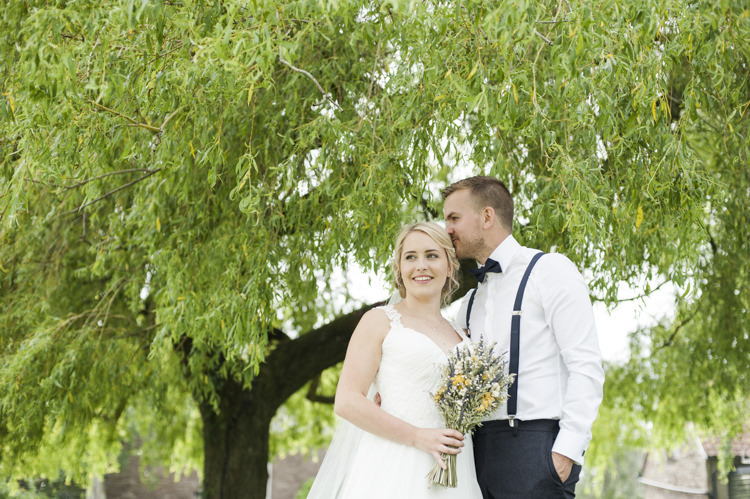 She’s actually based in the Netherlands and we met her through one of our friends whose wedding she also shot. 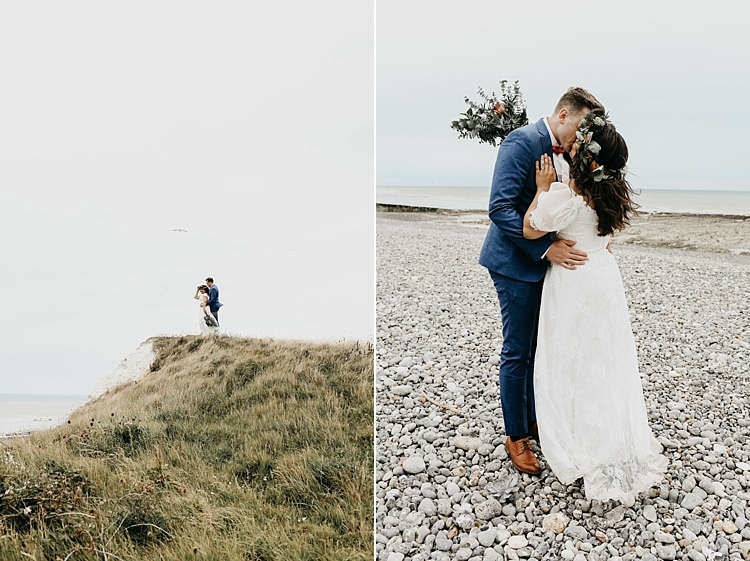 As Will is a wedding photographer and I vicariously live my photographer dream through him, we were both actually quite fussy about our choice. We have so many friends who are incredibly talented photographers but we didn’t want to pick between them. 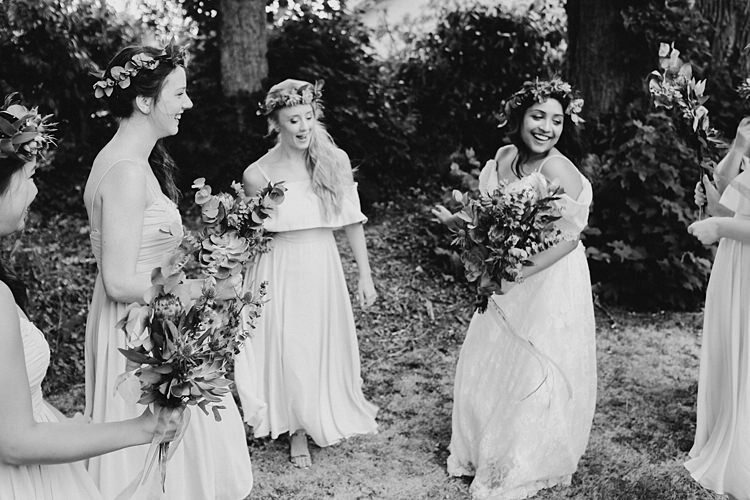 Luckily, we were introduced to Hind and when we saw her stuff, we knew we wanted her to capture our day. She did a great job in our couple shoot and the different creative elements that we put together for the day. THE DETAILS & DÉCOR | Pinterest saved my life when it came to décor. 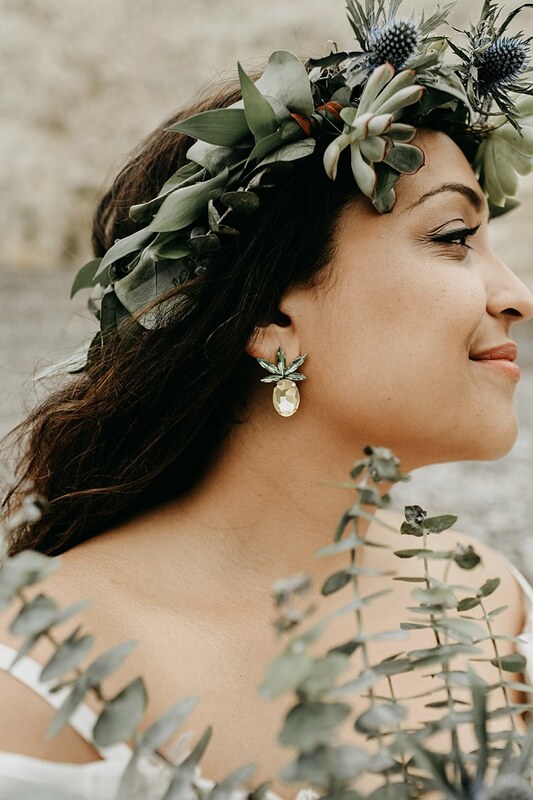 We were so inspired by the different ways couples had done their wedding that we felt bold enough to tackle quite a few DIY projects ourselves. We both love nature so we used different shades of green in our decorations. I’m also a big fan of metallic/shiny palettes so copper was my go-to as it was quite a warm colour and worked well with foliage. 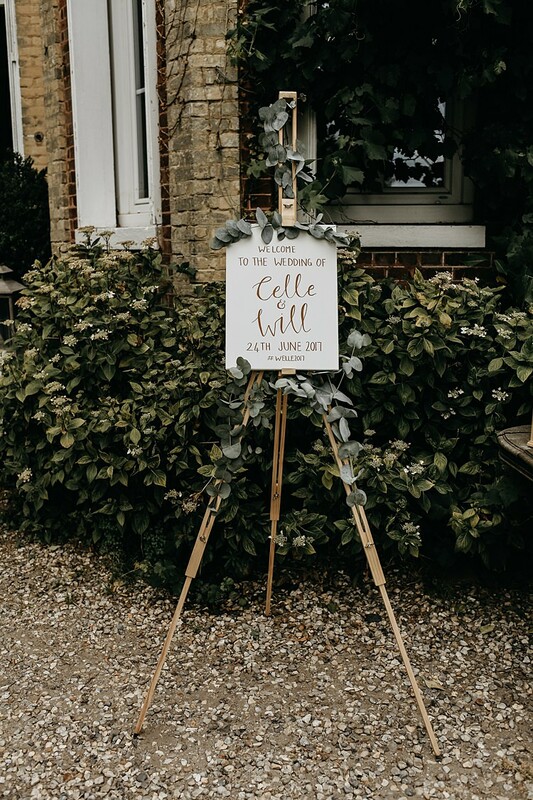 Will and I both loved the idea of having green and copper elements throughout our wedding and adding rustic touches like wooden signage and place names with it. We also opted for bamboo plates and crockery as it looked so lovely with everything else. I went to charity shops, Amazon, eBay and Hobbycraft for most of my bits, which saved us quite a bit of money. I also did a big haul at Primark for those geometric candle holders as they were a bargain in comparison to some extortionate prices I’d seen in other shops! I also popped into Poundland and found some lovely rustic-looking mini lanterns, which I used to decorate the aisle. I’m SUPER thankful for having creative friends who are hand-on and will go with the flow. A bunch of our mates worked on chopping up an old palette and painting it to make the different signs we had throughout the day (like the gorgeous sign directing everyone to different parts of the venue!) 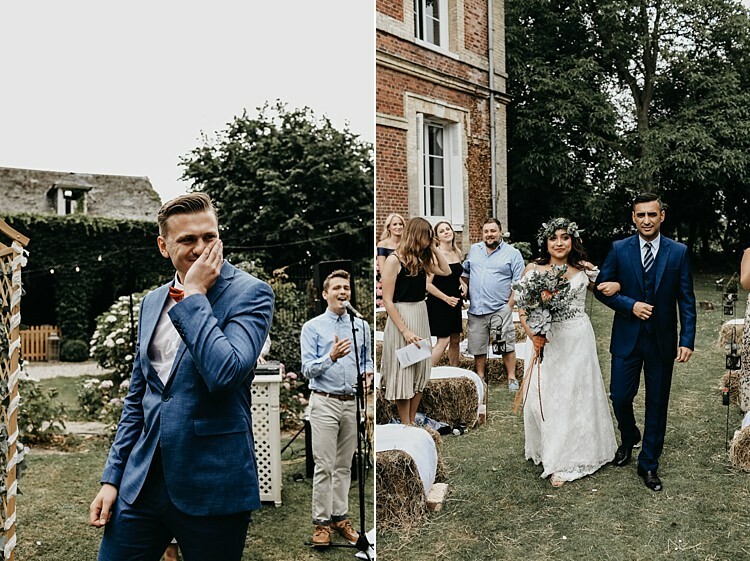 – Everyone worked so hard to make our wedding come to life! We also had mini lanterns filled with eucalyptus hanging from shepherd’s hooks to decorate the aisle and mum went to FabricLand for the material we used on the hay bales. We did our Save the Dates via Paperless Post. 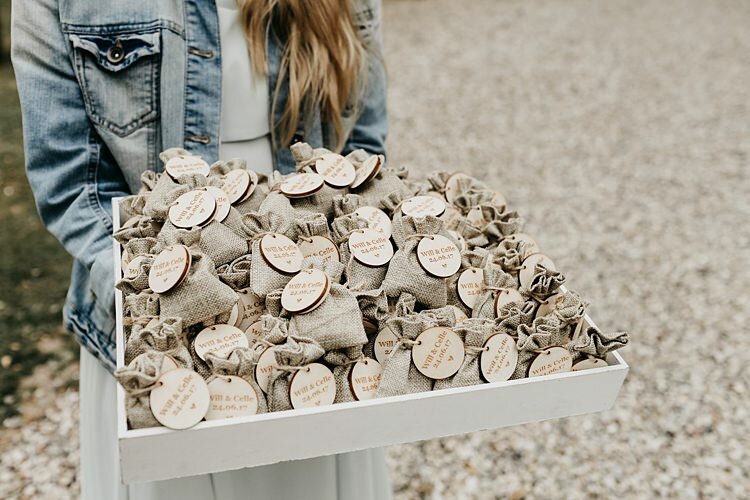 It saved us money and let’s be real, everyone tends to lose them (and paper invites!) so sending it to our guests’ emails meant it got put in their calendars as well. We also didn’t do paper invitations, which I was initially bummed about as I love stationery! However, it was just too expensive so we decided to brave it and make a website. It was the LONGEST ordeal ever as it takes quite a bit of time, but it was so worth it. 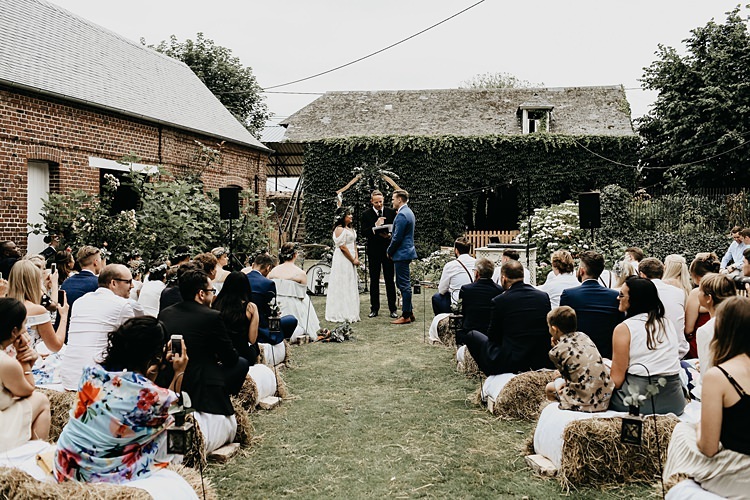 We emailed the site to everyone via our Paperless Post invite and that became our main mode of contact with our guests plus super helpful to keep everyone in the loop. 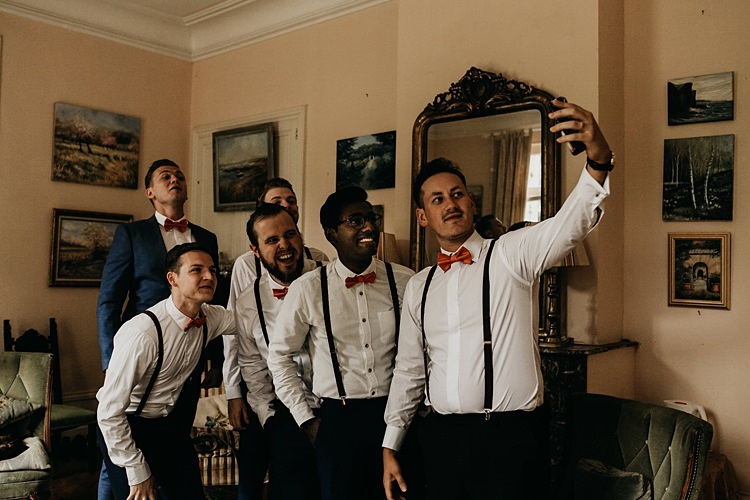 On the day, we had a Polaroid camera alongside the guestbook, which was such a fun way to capture memories and pictures of everyone. We originally wanted a photo booth but couldn’t afford one so we did the polaroid idea instead. 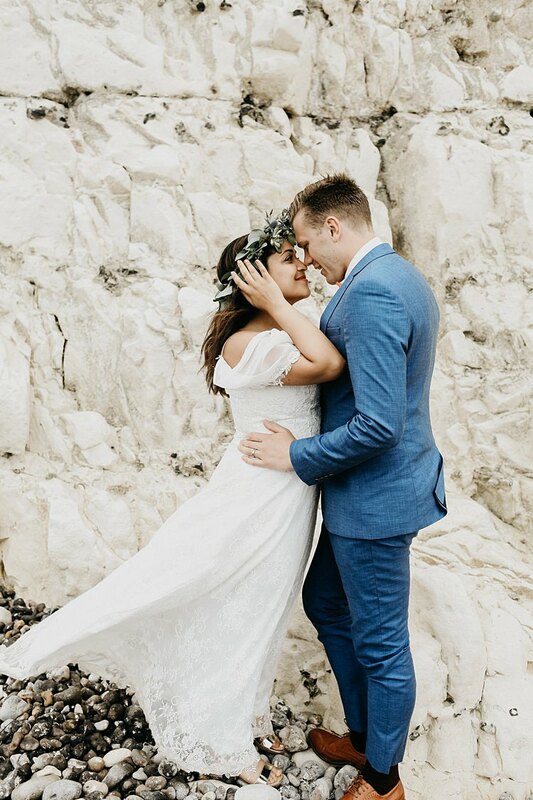 It was so awesome and is as much part of the wedding album as the professional photos! We also took so many on the dancefloor and they just make us relive the memories all over again. 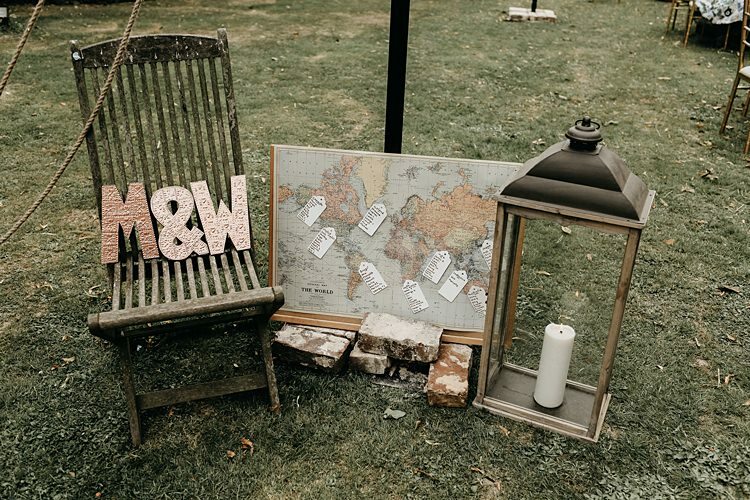 Our table seating plan was a vintage map I found and the table names were countries. Will and I are explorers so felt keen to represent it in our décor. We picked places we’d been to and also wanted to visit together. I wasn’t particularly keen on wedding favours only because I never find them useful (awful, I know) and people either chuck them or lose them. It was only until I found the lovely Perkulatte Etsy shop that I knew we should have favours. Will and I are coffee lovers (he came to love it when we starting dating!) and so we loved the idea of handing out cute ground coffee bags with tags that said “love is brewing”. 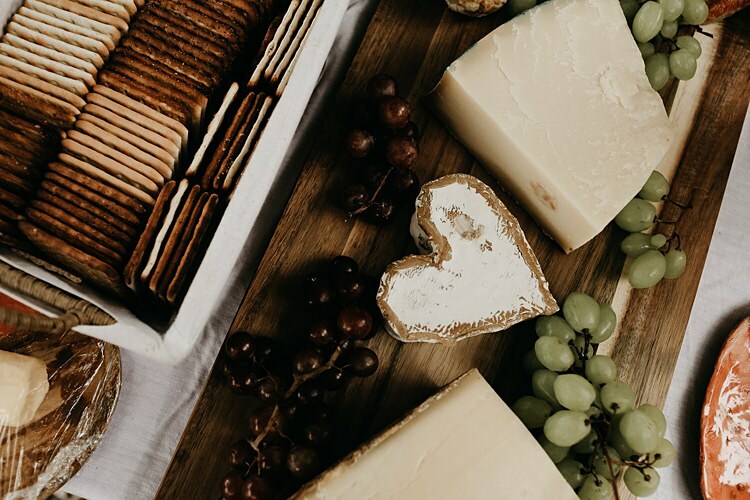 FOOD | Since we were in France, we wanted to have a big deli as the ‘starter’ so we served loads of cheese, cured meats, olives etc. in a buffet style. 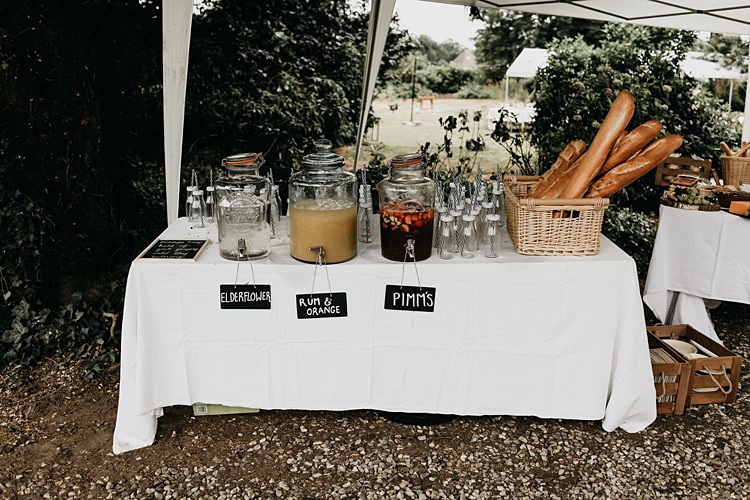 We had Pimm’s, Orange & Rum and Elderflower served in Kilner jars as welcome drinks. 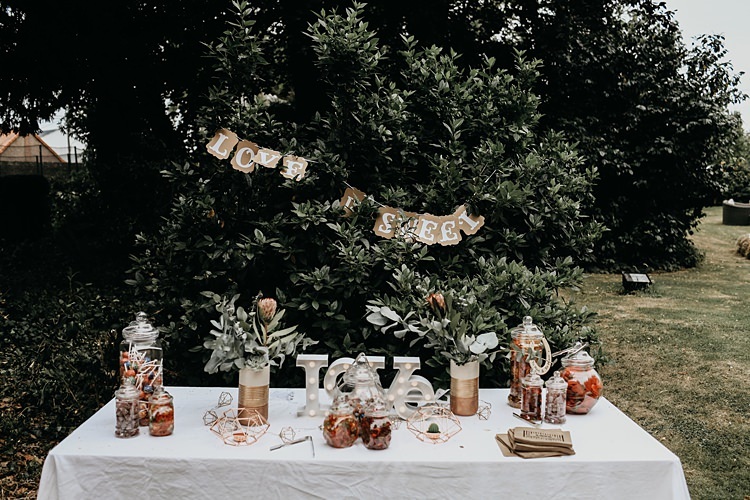 We had a French BBQ called mechoui for the main meal and to finish, we ate mini French desserts, the wedding cake and then also had a candy bar pick-a-mix. THE HONEYMOON | We went to Koh Samui, Thailand for our honeymoon and we had the most incredible time. 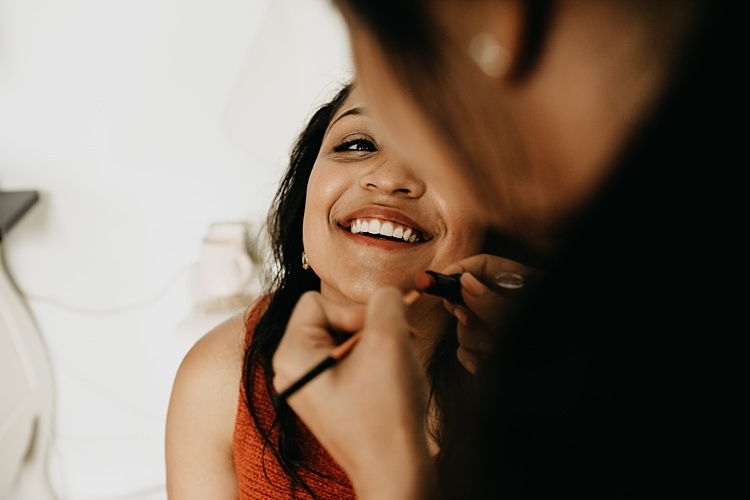 When you’re prepping for a wedding you forget that there’s a holiday at the end of it – best feeling ever! 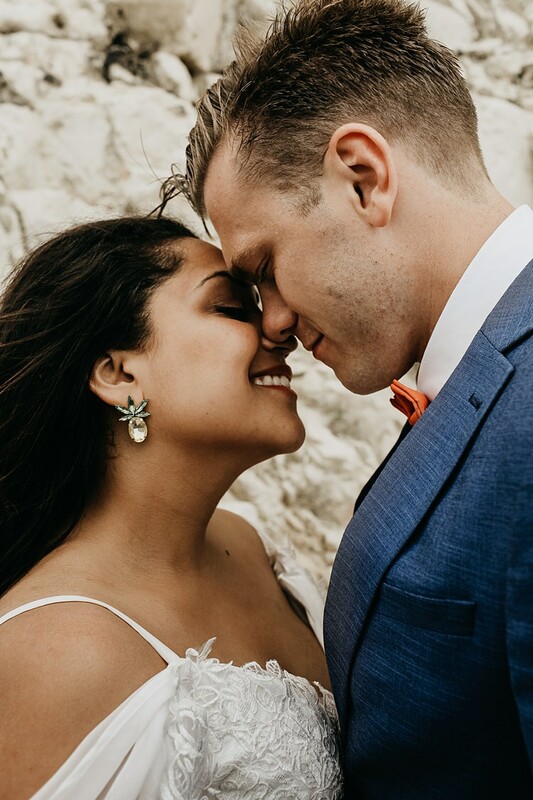 It was so rewarding to go off and relax so I highly recommend taking some time off to after your big day, even if it’s a mini-moon. We also got matching tattoos on our honeymoon – best decision ever. MEMORABLE MOMENTS | Before we got married, Will and I prayed for the day and our marriage ahead but he wasn’t allowed to see me in my dress. We met at the corner of the house and stayed back to back. It was such an exciting and precious moment together. We have a great friend who used to DJ professionally and we asked him to do the music for our evening party. All I can say is that it was absolutely insane. He went in and we didn’t stop dancing till 1AM! I loved that we had everyone at the dance floor (or most of them anyways!) and people just went crazy. I remember popping a prosecco bottle and making Will drink it and spilling it all over his shirt! I also lip sang to Beyoncé’s Crazy in Love and had a dance battle with Will, it was hilarious. To top it off, I jumped in the outdoor hot tub right towards the end of the night in my dress with Will and some of our mates. Best.Day.Ever. ADVICE FOR OTHER COUPLES | Honestly, do what you want to do. I know you’ll hear it often but it can’t be said enough. It’s a genuine word of advice that will change your life. Don’t let others dictate what you should or shouldn’t do out of tradition or fear of what guests might think. 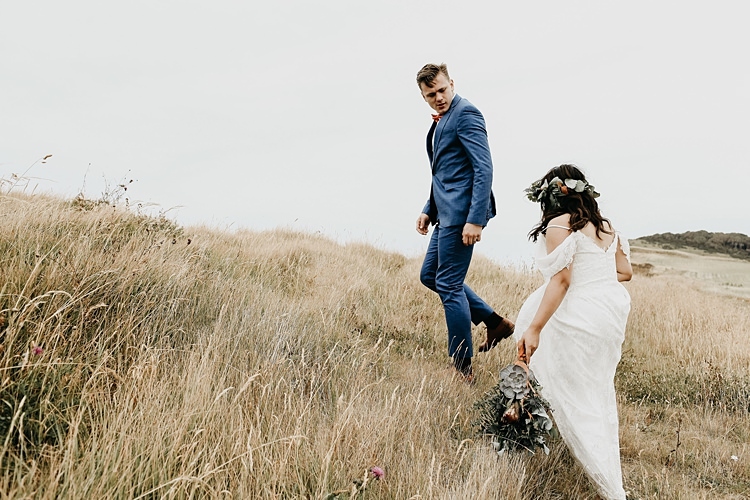 The people at your wedding are (hopefully!) people who love you both and are there to support you no matter what. Try and get you head around the logistics of the day. I definitely should’ve done a better handover to my chief bridesmaid (especially because it’s DIY) but never got round to it. Just makes it easier for everyone to feel like they’re on the same page plus, you aren’t doing everything on your own. 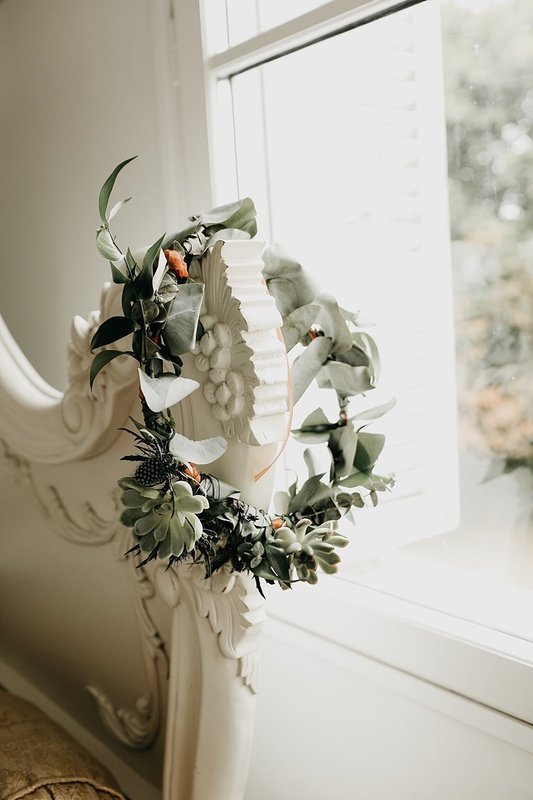 Make your decision on the décor and theme as soon as you can in order to buy your items throughout the year rather than a bulk buy. I bought our decorations and different bits as I went along so it would be easier financially to pay for it. One Foot in the Groove: Wedding Band. In the Hotseat. Ah, yay! 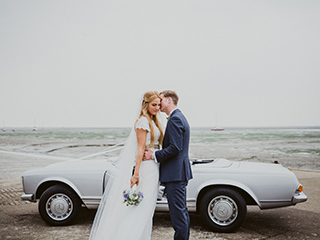 Thank you so much for featuring our wedding.